Dthree | Workplace Creators | Top tips for staying fit whilst in the office. Top tips for staying fit whilst in the office. DeVono Cresa share their top tips for keeping in shape whilst working that 9-5 office job everyday. If you work a 9-5 office based job, this means you are sitting sedentary for 8 hours a day, which can not only affect your physical health but your mental health too. Long term it can result in severe health problems including high blood pressure and even heart disease. With the ‘On your feet Britain’ movement starting on Friday 26th April, the team here at DeVono Cresa are making preparations to get started early. If you struggle to keep in shape and find yourself basing your fitness around your office hours, then here are some top tips for integrating these back in to your daily routine – both in and outside of work! Do not skip breakfast – They say breakfast is the most important meal of the day and here’s why – your metabolism slows down when you sleep, so eating soon after you wake up will help to boost this. If you’re in a rush, always make sure you have a snack or an instant porridge in your bag to eat at your desk. DeVono Cresa always ensure the kitchen cupboards are full of breakfast goodies for the team to help fuel their day. Lose the lift and take the stairs – it is naturally easier to take the lift instead of the stairs, especially in the morning, but we recommend taking the stairs at least a few days a week, or depending on what floor you work on, compromising by walking just half way up before catching a lift the rest of the way. Go for a walk on your lunch break – the fresh air will clear your mind and help alleviate any stress built up that morning, as well as providing your body some physical exercise. 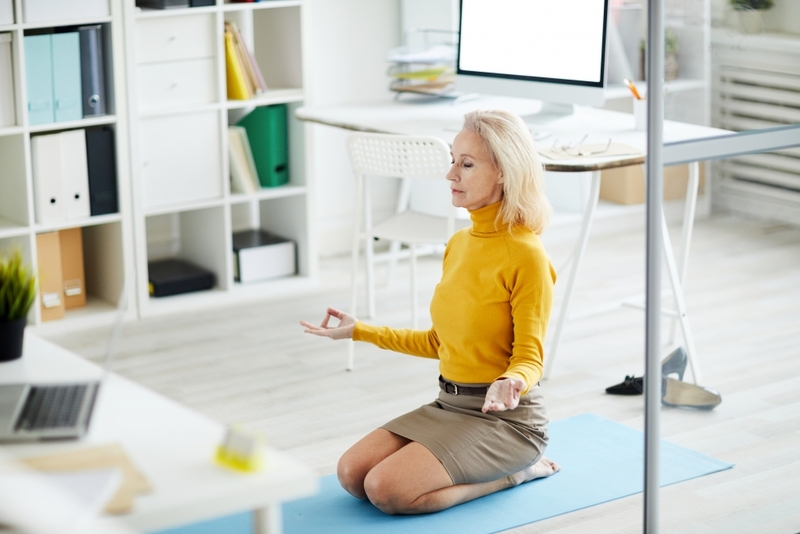 Move around the office – when your concentration stalls from sitting still for too long, carry out some stretching exercises in the office and take a break away from your PC every half hour. Your eyesight will benefit from this too! Instead of phoning a colleague, get up and walk over to their desk. Face to face conversations and human interaction also promote better well being and ensure improved communication. Walk around while you’re on the phone – supply your staff with headsets if they do not have work mobiles to promote physical movement and mental ‘flow’. The added advantage of moving the ‘loud talkers’ away at times provides a little rest bite for those other staff who sit close to this distraction! This property has its own on-site gym, perfect for getting that workout in either before, after work or during lunch hours as there are on-site showers too. Airflow and fitness time trial runs in the stairwell encourage constant daily use even with the impressive 13 floors to cover! The weekly food market in Lyric Square also delivers a gastronomic experience for all self-proclaimed foodies with delights from many continents covered! This property has a fully equipped gym where you are also able to book personal training sessions. As a member you’ll find yourself looked after with health juices and specially whipped up perfectly balanced meals and snacks whether taken in the onsite restaurant or from the comfort of the top floor luxurious lounge bar. Of course, as you would expect, access to classes with a programme of yoga, HIIT classes, Pilates and TRX is included for office residents. Take part in our national day when workers across Britain unite together and participate in a variety of fun and simple activities to #SitLess and #MoveMore at work on Friday 26th April 2019.